NEW DELHI, NOVEMBER 12: Camille Chevalier produced a fairy-tale finish with birdies on the last two holes to grab the Hero Women’s Indian Open from under the overnight leader Michele Thomson’s nose. Coming into her own and finding her rhythm just as at the right time, Chevalier, who turns 24 next month, birdied five of her last eight holes and sprinted past the field to win by one. Chevalier (67) ended at 12-under 204, while Thomson (71) was 11-under 205. There was a three-way tie for third with Carlota Ciganda (70), who spiced up the front nine with an eagle and two birdies, Anne van Dam (67), who had eight birdies against three bogeys, and Sarah Kemp (71). Vani Kapoor (72), playing her seventh Hero Women’s Indian Open and the fifth as a pro, registered her best result ever on the LET at Tied-seventh alongside Klara Spilkova (70) and Celine Boutier (72). They finished at 7-under 209. Defending champion, India’s Aditi Ashok, just couldn’t get her putts to drop as she carded 72 and finished at 4-under 212 and in T-13 position, while Gaurika Bishnoi (77) was off-colour and finished T-44. For Vani, the earnings of US$ 9,639 pushed her to 73rd place with US$ 17,749. The Top-80 keep the card, but many of those who have played less than five events will come off the list and Vani could improve her position. Vani is due to play the Sanya Ladies in China next week and could get an invite to the season-ending Omega Dubai Ladies. 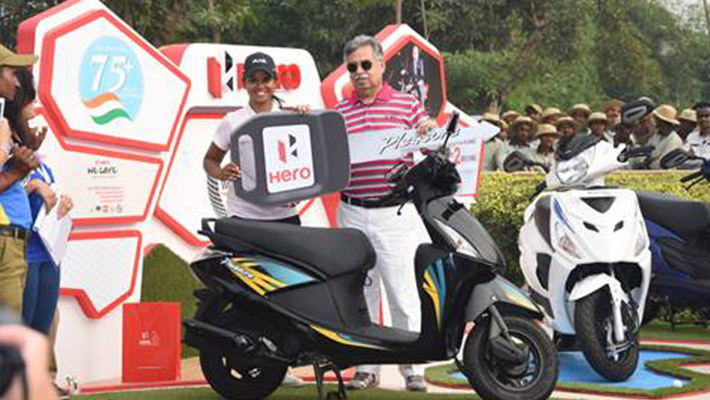 Chevalier became the third successive LET rookie to win the Hero Women’s Indian – Aditi Ashok in 2016 and Emily Pedersen in 2015 did that – and before them Caroline Hedwall was the first to do so in 2011. She confessed, “I really didn’t get affected by anything, because I didn’t expect that I was going to win. I was more concerned about keeping my card for the LET next year, because I was border line, so I’m really happy to be keeping my card because I was so stressed about it.” For a good part of the day, it seemed Thomson on the verge of her own dream story. Coming back to pro golf after a four-year hiatus from 2009 to 2013, she made her way to the LET through the LET Access Tour this year and nearly won. The cop-turned-golfing star, Thomson blitzed the course on Saturday with a record-breaking 8-under 64, had a great front nine with four over birdies. It seemed the door was firmly shut and Thomson had bolted away with the trophy. The back nine is where the drama began. Thomson bogeyed ninth and tenth and door opened slightly and when she double bogeyed the Par-4 14th. She blocked her drive into the hazard on the right, took a penalty drop and them came out only to miss the green. As she double bogeyed, her playing partner Chevalier birdied the hole for a three-shot swing. Thomson dropped to 10-under and Chevalier, who birdied the 11th and 12th to get 9-under, added another birdie to climb to 10-under. Thomson fought back to take a slender lead with a birdie on par-5 15th, which Chevalier failed to birdie. A birdie on 17th meant they were level again, raising possibilities of a play-off. The French girl played a bold second shot on the 18th over the water and the ball landed on the slope and rolled towards the hole and stopped three feet from the pin. Thomson’s second shot was 15 feet from the flag. As Celine Boutier, the third player in the group, found her only birdie of the day, Thomson missed hers. Chevalier made no mistake with the three-footer and the trophy was hers. As a fan of Roger Federer, the French youngster Chevalier, who played tennis for almost 10 years, shifted to golf only when she was 15. “I played 10 years of tennis when I was younger and I really loved it but I was better in golf. I stopped practicing as much when I was 15, because I wanted to focus on golf and school,” she revealed.